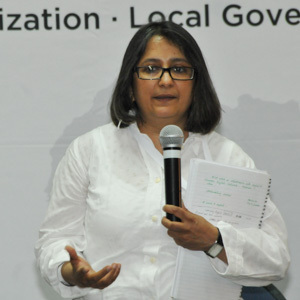 Anuradha Joshi introduced to the international context and trends with regard to accountability. In the last years development actors seem to be increasingly aware that success and sustainability of development and thus development cooperation directly depend on the quality of public institutions in the countries. The Busan Declaration « Partnership for effective Development Cooperation » of 2011 mentioned transparency and accountability as a factor of development and cooperation in various dimensions. The most recent example is the discussion around the post-2015 agenda and the new Sustainable Development Goal SDG No. 16 that was proposed : « Promote peaceful and inclusive societies for sustainable development, provide access to justice for all and build effective, accountable and inclusive institutions at all levels ». The OECD DAC guidelines of 2014 on « Accountability and democratic governance: Orientations and principles for development » particularly show that accountability is crucial for a qualitative (and not purely quantitative) approach to development. Under the heading of « democratic accountability » it is clear that political and social dimensions of accountability must go together, and a variety of actors (such as the parliament, the justice system, media and independent oversight institutions) play a crucial role in holding governments responsible. Helena Bjuremalm referred to the guide on accountability in services that was recently published by International IDEA. 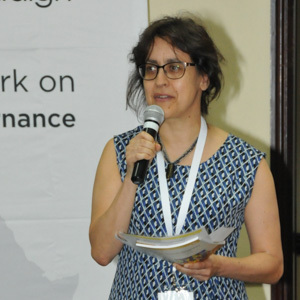 This guide focuses on the quality of local accountability mechanisms for service delivery, taking into account that it is the responsibility of local actors to make reforms – and they should be supported in holding service providers accountable. The guide aspires to support its users to assess the degree to which public service delivery is subject to democratic accountability checks and, based on that knowledge, identify areas of concrete action for improvement. Under the heading of accountability the guide addresses transparency, responsiveness of services, and enforceability in different stages. The step-by-step approach also helps its users to build strategic alliances and select windows of opportunities to support social and political accountability at different levels. It addresses accountability in a systemic perspective taking into account that long term sustainability of services directly depend on accountability systems in place. Acording to Anuradha Joshi, the international debate shows that a systemic perspective is important. Social, political, bureaucratic, judicial accountability mechanisms can reinforce – or hamper each other. The legal and judicial dimension of accountability has a strong anchor in the international human rights movement : the international human rights convention are an important framework for accountability and often provide the standards for (social) accountability mechanisms. Of course, context analysis is important as well as sector analysis : Different mechanisms will be successful to generate accountable relations between the governments, service providers and users in specific sectors, e.g. health, or water. An important challenge is the vertical dimension of accountability : How can we bring the positive experience made at local level to a more strategic, national level with a view to strengthen overall accountability of power holders? The new IT technology has opened new ways and means to distribute and access information from a variety of sources, particularly for marginalized groups. The new ways of sharing information (social media) made the mobilisation of public support easier, and has supported those asking for accountability and helped to reduce their vulnerability, e.g. in the case of denouncing corruption. A main challenge remains : how can we assess the impact of accountabiliy mechanisms ? What are the key elements that really matter in accountability systems ? Where to find evidence for success or failure of promoting accountability? In any case it is important to design mixed methods of measuring outputs and outcomes, based both on quality and quantity of results. And outcomes and outputs must be carefully phased : Building effective accountability system will need time. The focus on accountability is not so much about new tools and instruments : There is already a multitude available. Accountability is more about a new perspective, an attitude and approach to our every-day work, and it makes careful context analysis a must. Accountability is shaping mutual relations and interactions between citizens and authorities : Citizens also have responsibilities towards the State structures, not only rights. A variety of examples showed the great opportunities provided by the new technologies to address information gaps. A lot of practical experience is already available and should be shared. However, information alone will not address power gaps. A certain tension can be observed between effectiveness/efficiency and accountability: accountability systems are consuming time and resources and refer to a long term process of change, while efficiency is needed to get short term results. Tactically, quick successes must be combined with long term changes. Accountability issues must be carefully and continuously assessed as they can change rapidly. Issues both at national level as well as at local level need to be assessed. Donors are often applying methodologies to assess accountability all over but this should be more differentiated. Moreover, accountability mechanisms must absolutely be designed in resonse to a certain context : Donors should not push for mechanisms that are not adapted e.g. to the limited resources available. Accountability systems are never in the interest of those in power – so political willingness for reform in this area is often very limited. Political economy analysis can help to find the gaps – and build strategic alliances for change. The question is also how to find incentives for bureaucrats and politicians to buy into building up effective accountability mechanisms. Accountability focuses on the mechanisms to hold the powerful responsible for implementing a certain standard that is already predefined. Accountability asks authorities to stick to the existing rules and frameworks – it is not about changing the rules but building mechanisms and procedures to secure the implementation of predefined rules. By asking governments of receiving countries to be accountable for the money transferred, donors often divert attention of governments from national accountability systems. Governments depending on donor money will not feel responsible and will not be responsive to their citizens’ needs. While the donors are accountable to their own taxpayers (and often their internal political agenda) it is important that they aspire to strengthen national accountability systems instead of building parallel reporting systems. In situations of fragility public institutions are often challenged by a lack of trust. Improvements in service delivery, closely linked to the building-up of effective accountability systems that ensure services without discrimination, can help to build such trust.